The latest Apple smartwatch is also an EKG. Apple says the latest version of its smartwatch is the first over-the-counter product to take readings through electrocardiography. The tech giant announced updates yesterday that push its Apple Watch further into medical device territory. 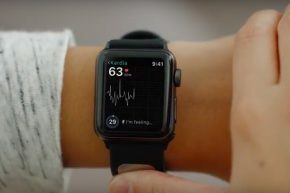 The new watch will have the ability to take high-quality heart readings to detect irregular heart rhythms and other potential problems, which Apple says will be able to be shared with doctors. It can also detect falls and contact emergency officials.